Receiving the golden boot from his children today. 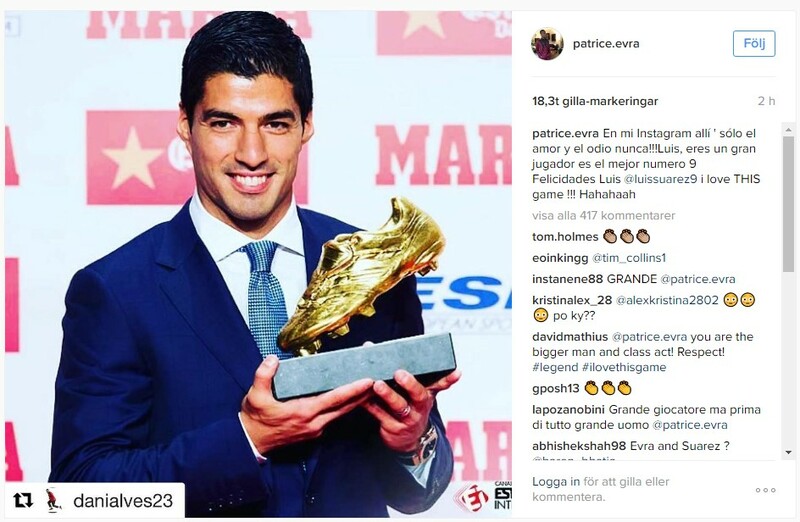 Nice to see that even Evra congratulate Suárez. Evra is a very nice guy. The Ballon d'Or is more to do with marketing and press than for achievements on the pitch. I've earned all the awards I've been given. The Golden Shoe is for scoring the most goals and there's no option for people to take that away from me. I don't have a chance [with] the Ballon d'Or because it works around marketing and I don't have that. My ambition is to win another Champions League, that would be great. On Messi being an another reason why winning Ballon d'Or is impossible for him. Of course,. But I was referring to getting on the podium. To win it is impossible because I have the privilege of playing with the best in the world and an excellent person. He's the best in history. I don't compare myself with anyone. I have my way of playing and being, which is different. My way is to help the team. If individual awards come they're welcome because I'm a goal scorer and, sometimes, egotistic. But your teammates don't let you [get carried away] and that's something you're most grateful about. You learned of that meme only last week on a different forum didn't you? Last edited by Horatio; 21st October 2016 at 09:15 PM. you weren't 2 years ago around here , were u ? I was in South America dating models that whole year, so no. He didn't say which gender.